Pournami lottery ticket has 9 prizes including consolation prize. The first prize winner got 65 lakhs rupees and the second and third prizes are 5 lakhs and 1 lakh (1 prize in each series) respectively. A total of 193345 prizes were given to the winners. 10% of the prize money is considered as agent’s commission and given to the agent who sells the winning tickets. 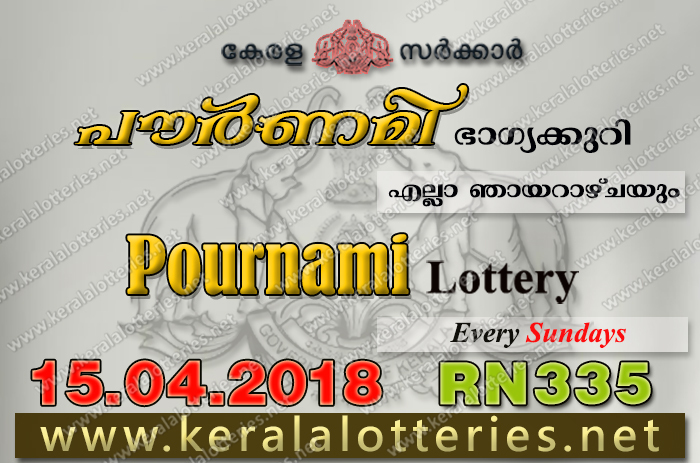 Kerala Lottery Result Today 15-04-2018 is pournami lottery RN 335. 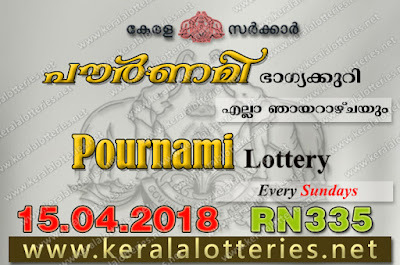 Today kerala lottery result will be announced on 15/04/2018 at 03:00pm. The kerala lottery department held the draw of RN 335 Pournami lottery today 15.04.2018 at sharp 3pm with the presence of officials in the Auditorium of Sree Chithra Home Thiruvananthapuram.